A definite favorite of the summer fruits; peaches. Juicy and sweet. Soft and supple. How can you go wrong with a fresh peach? We enjoy topping our cereal or yogurt with them, or just eating throughout the day. Now we have a new way of using them up; frozen yogurt. This recipe is easy to make and only requires 3 ingredients. This was intended to be unsweetened as we don’t care for overly sweet desserts. 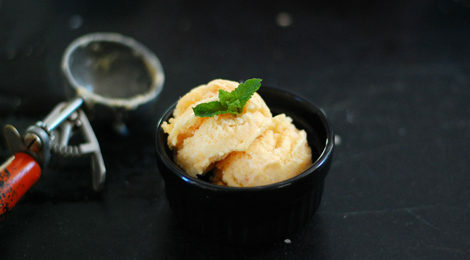 The result is a tangy, creamy, slightly sweet sherbert-like dessert; a deliciously addicting dish you can enjoy any time on a hot summer day. If you are a sweet tooth and would like it sweeter, feel free to use 1/2 cup (at most) of pure maple syrup while blending everything together. 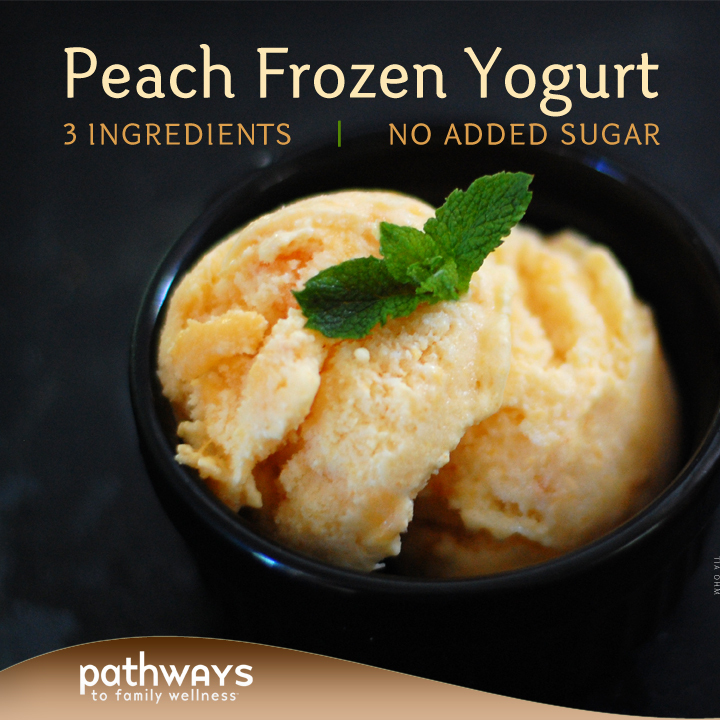 Blend together 3 chopped peaches, yogurt and vanilla in food processor until smooth. Take your ice-cream maker (having sat it in the freezer overnight) and add your peach/yogurt blend. Freeze in ice-cream maker as per directions. This step usually takes about 20 minutes. In the last 5 minutes of your freezing step, add your remaining chopped peaches (this will make it a chunky frozen yogurt). 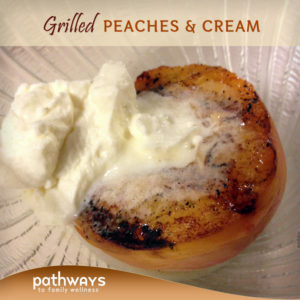 If you want a creamy frozen yogurt, skip this step and add all peaches in the beginning. Serve immediately as a soft serve, strongly recommended (see notes below), or put in freezer to harden. Note: Your frozen yogurt will be at it’s best consistency immediately after it has been churning and put through the ice cream maker. 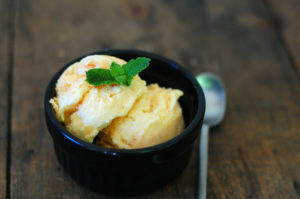 It will be a frozen, soft serve consistency which is ideal for homemade ice-creams. 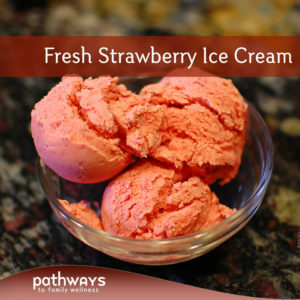 If you want to freeze it, we recommend putting it in a separate air-tight container (to limit freezer burn effects). The longer you let it freeze, however, the icier and harder it will become. We made the mistake of letting it freeze in the ice cream maker over night. It took multiple hours for it to thaw (shown in pictures) and ended up being somewhat icy, but still very tasty. If you let it freeze in a separate container, it should only take about 20-30 minutes to thaw to an edible consistency. 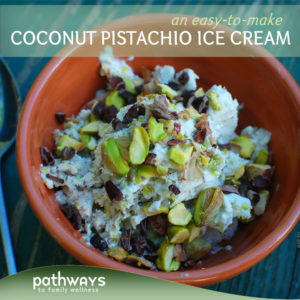 If you want, you could use Greek yogurt which may help minimize the icy effect, and make it more creamy. Of course we will opt for what we make at home, which is just a regular plain, full-fat yogurt; this is delicious as well.